The entire island of Puerto Rico, home to 3.4 million Americans, is still without power after a direct hit from Hurricane Maria, the fifth-strongest storm to ever hit the United States. Cell phone and internet service has also largely been lost and it could take six months for the Puerto Rico Electric Power Authority, which is $9 billion in debt, to restore electricity. Puerto Rico is now facing disastrous flooding. “It was as if a 50- to 60-mile-wide tornado raged across Puerto Rico, like a buzz saw,” NOAA meteorologist Jeff Weber told Vox. 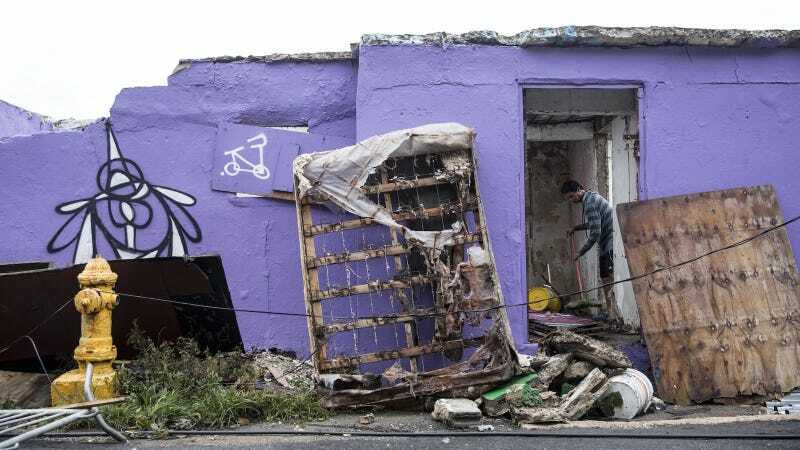 The death toll is reportedly at 13 on the island, with a total death toll of 32 across the affected islands, including Dominica, the French territory of Guadeloupe, and the US Virgin Islands. Maria is now nearing Turks and Caicos, and that number is seen as likely to rise as rescue efforts continue. As of Friday morning, the full impacts of Maria on Puerto Rico remain unknown. FEMA has begun delivering assistance, and an airport tarmac opened on Friday to limited emergency assistance flights; Donald Trump has declared his intention to visit the “totally obliterated” island, where I’m sure he’ll be well-received. “Cities or states that receive federal emergency aid have to provide some sort of a matching fee—I think the idea is to get that waived,” New York City Council Speaker Melissa Mark-Viverito told Jezebel in a phone call. Mark-Viverito has made contact with her family on the island, who are safe. “In Puerto Rico we have this issue of the Jones Act, which means that transporting anything to the island by boat has to be on [U.S. flag ships], which makes it much more expensive to transport stuff to Puerto Rico, so we’re asking for a waiver for the Jones Act to add flexibility. There’s also the issue obviously of the fiscal crisis,” she said. Many other people in the US are still unable to get in touch with relatives on the island, including Jennifer Lopez, who released a video Thursday night asking people to donate to the efforts of First Lady of Puerto Rico Beatriz Rosselló. In addition to the First Lady’s fund, there are some other resources for people interested in helping out. On Thursday, the Hispanic Federation, in partnership with Mark-Viverito, Mayor Bill DeBlasio, Reps. Nydia Velázquez and Adriano Espaillat, launched “Unidos”: A Hurricane Relief Fund for Hurricane Maria Victims in Puerto Rico, where 100 percent of the proceeds will go to hurricane relief and recovery efforts. “At some point the idea is to identify local grassroots groups, which we will vet, so that the money that is collected here can be directed to the people, as opposed to giving it to the government to figure out what to do,” Mark-Viverito told Jezebel. If you live in the Miami area, the Puerto Rican Leadership Council is accepting donations of nonperishable food, water, and clothing at several locations beginning on Friday, with details and timing over at the Miami Herald. The Miami Foundation created the US Caribbean Strong Relief Fund to raise money supporting hurricane relief efforts in Caribbean nations and territories affected by Irma and Maria. Philadelphia-area nonprofit El Concilio has launched Unidos PA’ Puerto Rico to raise money for hurricane relief. The Salvation Army is accepting hurricane relief donations, and GlobalGiving has a Caribbean Hurricane Irma & Maria Relief Fund, which will initially steer funding towards immediate needs like food, clean water, and shelter, and will later shift toward supporting local organizations’ recovery efforts. Volunteer disaster relief organization All Hands is headed back to the US Virgin Islands for Hurricane Irma and Maria Response, and there is a crowdfunding effort by the Dominica London High Commission to raise money for basic relief materials on Dominica, which has been left in “war zone” conditions; you can donate to that effort here. ConPRmetidos, a Puerto Rico-based nonprofit, is accepting donations here. If you’re in Puerto Rico or any of the islands hit by Maria, and are able to safely make contact in the coming days, please reach out to the email below to tell us your story. UPDATE: We’ll continue to add charities here as necessary—another good fundraiser was spearheaded by former pro basketball player Tim Duncan and has already raised over $2.6 million for relief in the US Virgin Islands, where he grew up. The entire island of St. Croix is currently without power, according to US Virgin Islands Gov. Kenneth Mapp. UPDATE 9/24: GoFundMe created a centralized page for Hurricane Maria relief campaigns, check it out here. UPDATE 10/3: Mercy Corps and Oxfam have joined relief efforts.